You have to give GI Joe: Renegades credit for being willing to shake up the status quo. Not just killing characters off or giving them different origins, but actually changing the team's organizational structure. In no other continuity is Scarlett the team leader. For those who haven't seen the series and think it odd that Scarlett would be the only one to mistrust Cobra, remember that this isn't the world you know: in their world, Cobra Industries is a friendly company that does telecom, defense and even retail business. So imagine if Apple, Blackwater, Walmart and Sara Lee were all the same company, with George Clooney as its friendly CEO, and you'll get why everybody thinks Scarlett is nuts. The Renegades toys have all been untooned, but the similarity to the animated originals varies. Scarlett's hair is plastered down on her forehead a bit too much, but in general the "realistic" sculpt looks like it could be the same person represented by the cartoon. And it certainly looks better from angles than from straight ahead, but it still looks good. The last time we got a cartoon-based Scarlett, it was the Resolute version, which turned out rather poorly. This one turns that around. Rather than a unitard and tights, this Scarlett wears normal pants and a brown turtleneck. Of course, she has a padded/armored vest above that, so she's clearly not a civilian. For all its laser pistols and bio-engineered goop monsters, Renegades keeps one foot in reality by dressing its characters like real people, and this looks like something a live-action Scarlett could wear (and still be recognizable). The colors are better than on Resolute Scarlett, making her more likely to pass "the squint test." Though her limbs are thin, the toy doesn't feel flimsy at all. Her articulation is worth mentioning, as well. For the most part she moves like any other G3 Joe: balljointed head, torso and hips, swivel/hinge shoulders, elbows and ankles, swivel wrists and double-hinged knees; however, a few small changes make a big difference. If you remember the Resolute Scarlett, her torso joint cut right through the chest armor. On this version, the armor is complete, and the joint is hidden under the edge of it, making her torso appear seamless. Secondly, instead of the ankle pegs coming from the feet and going up into the shins, they're attached to the shins and go into the feet. 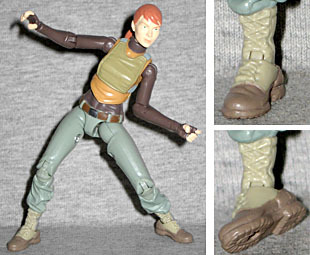 That may sound meaningless, but it allows her feet to rock side-to-side, which is much more natural than the way Joe feet (and action figure feet in general) move. Scarlett's accessories are mediocre. She gets a plasma pulse pistol (not the same one Duke had), and a rerelease of Resolute Scarlett's two-piece crossbow. 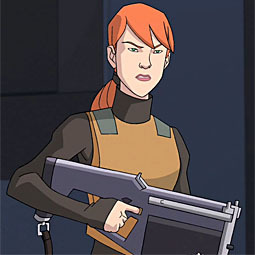 That's a bit disappointing, since while she did use a crossbow in the cartoon, it was a crossbow specific to Renegades. Of course, who but big nerds like us would ever even notice the difference? And come to think of it, the weapon on the show had a really clunky design, so this might be for the best. It's a bit blasphemous to say this, but this is the best Scarlett figure that's ever been made. She's got a great design and nicely innovative construction. 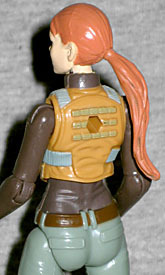 And yes, we know that with GI Joe (much like with Transformers) anything that's not a straight Generation 1 update is a second-class citizen, but in 30 years of toys, this is the only Scarlett capable and deserving of standing next to ToY runner-up Snake-Eyes.